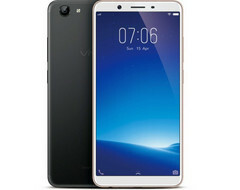 The new Vivo Y71 phablet has a generous 6-inch display and features a low-end Qualcomm Snapdragon 425 processor, 3 GB RAM, just 16 GB internal storage (expandable thanks to a microSD slot), as well as a single 13 MP camera on the back and a 5 MP selfie shooter. However, it also comes at a price of around US$168. The Indian market is dominated by Xiaomi and Samsung, but there is room for other brands as well. Vivo is one of these brands fighting for a slice of the pie and the new Y71 phablet might be one of the devices that could help them be more relevant in India this year than in 2017. The main attribute of the Vivo Y71 is its size because — unfortunately — there is nothing special about it otherwise. The 6-inch display has a rather low resolution of 1,440 x 720 pixels, but together with the low-end Qualcomm Snapdragon 425 processor, it should help the 3,360 mAh battery provide a better autonomy. Next to them, the list of specs and features also includes 3 GB RAM, 16 GB internal storage (there is also microSD support present), a 5 MP selfie camera with "AI Face Beauty" mode, a 13 MP main image shooter, but it runs the Android 8.1 Oreo-based Funtouch OS 4.0 mobile operating system. Since its local price is the equivalent of less than US$170, it shouldn't be surprising that the Vivo Y71 has a plastic case and is only available in black and gold. This phablet will hit brick and mortar locations across India tomorrow, while online retailers will add it to their portfolios on April 16. For now, there is no word about its international launch, so those who find this device interesting might want to look at one of the similarly priced (and more powerful) Xiaomi devices, for example the Qualcomm Snapdragon 625-powered Redmi Note 5.